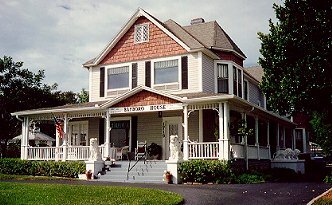 TravelASSIST’s "The Register" of B&B’s, Inns and small hotels is the Internet’s earliest B&B resource. Properties listed with us are world-wide and all have something unique and special to offer. 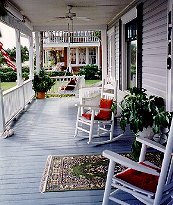 Florida is no exception and the sampler that follows contains one paragraph each from a number of Florida properties to tempt you. To access their full listings, including color photos, rates and contact information, simply follow the links to The Register. Tim and Jane Marquis welcome you to our intriguing Caribbean-style home, where unique furnishings, peace and quiet and leisurely breezes prevail. Our private, sandy (shallow, rocky shoreline) invites you to scuba dive, snorkel, and swim. Enjoy our tiki-hut, nap in a hammock between tall palms, take a nature walk, soak in the hot tub, or ride a bicycle or pedal boat.... Here your time is your own. Andrew's Inn is located in the heart of Oldtown Key West. For the very best in guesthouse accommodations just step down our secluded lane in the 900 block of Duval Street. Full breakfast served pool side is included each morning and cocktails are always on the house. Andrew's Inn is considered by many to be the best in Key West. The Incentra Carriage House Inn consists of three houses offering varied accommodations surrounding a lush tropical garden and pool. A continental breakfast is included for all. The Inn is centrally located one block from Duval St. on historic Whitehead Street. The Hummingbird Hotel is a newly renovated Bed and Breakfast Inn conveniently located in the center of charming, historic Lake Worth, Florida. The original building dates from 1930 and was constructed of native pine. The interior retains many fine period details, such as hand-laid tile floors, and a glass-cubed wall in the breakfast room. Guests will enjoy comfortable rooms with air conditioning, cable TV, direct-dial telephones, and a warm, personalized touch. An expanded continental breakfast is served daily. Click for vacation rentals in West Palm Beach. "Fairy tales can come true . . ." A storybook inn with an around-the-world look to its cottages grouped at odd angles, its fountain courtyards, balconies and fascinating furnishings. Winner Uncle Ben's -- Ten Best Country Inns of 1991-'92. The Mobil 4-star restaurant is famous for superb fare and caring attention. Chalet Suzanne is AAA 3 diamond Inn and listed on Nat'l Register of Historic Places. Historic designated, waterfront Queen Anne home with wrap-around verandah is located only 2 minutes from downtown St.Petersburg. Expanded continental breakfast, complimentary wine and soft drinks, morning paper at your door, off-street parking are a few of our amenities.. Each room has a private bath, color TV, VCR & movies, and is appointed in antiques. Region: 8 miles off the coast of Sarasota FL, 1 hr. south of Tampa, 2 hours west of Orlando Turtle Beach Resort is a small "Key West" style waterfront inn on beautiful Siesta Key in Sarasota, FL. We are famous for our private hot tubs in each cottage/villa. There are themed decors: "Victorian", "Key West", "Country Cottage", "Southwestern", etc. We have just received a 3 diamond rating from AAA. There is a private boat dock, fishing poles, paddleboat, and bikes all included. Make your Florida visit a memorable one when you stay at Inn at the Beach Resort. We're the perfect beach getaway! At your foot steps are the sparkling waters of the Gulf of Mexico and Venice Beach, internationally renowned as the "Sharkstooth Capitol of the World". Your days can be as active or relaxed as you wish. Enjoy our heated pool, play tennis at nearby courts, go fishing, or simply walk the beach.